Epiphone presents the Ltd. Ed. 1970's Inspired Les Paul Custom Blackback PRO, now with Epiphone’s critically acclaimed ProBucker™ humbuckers that bring back the legendary “PAF” sound plus coil-splitting. The original Les Paul Custom made its debut in 1954 after the initial success of the Les Paul Goldtop. Mr. Les Paul suggested white as the color for his new namesake “Les Paul” because it went well with a white tuxedo on stage. From that point on, the Les Paul Custom has often been referred to as the "tuxedo" Les Paul. The new Ltd Ed 1970's Inspired Les Paul Custom Blackback PRO in an Antique Ivory finish has all of the vintage LP Custom’s classic features including gold hardware, a fully bound body, neck and headstock, pearloid inlays, and best of all, Epiphone’s new ProBucker™ pickups. The critically acclaimed Epiphone’s ProBucker™ pickups have become the talk of the industry for bringing “PAF” humbucker power to players everywhere, and all at an Epiphone price. We think you'll agree that the Epiphone Les Paul Custom is "dressed to kill." Epiphone has reproduced the beautiful faded look of vintage Les Paul Customs with an “Antique Ivory” finish that looks just like a well-preserved vintage Les Paul Custom. 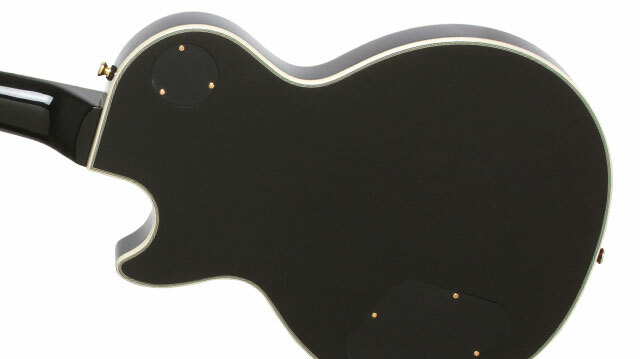 Plus, Epiphone has also reproduced the “Blackback”, a common feature in 70s era Les Paul Customs. Finally, Epiphone equips this Ltd. Ed. LP Custom with classic "open-window" ProBuckers™, each voiced for maximum response for lead, rhythm or any combo you choose. The Ltd Ed 1970's Inspired Les Paul Custom Blackback PRO sounds like the real thing because it is the real thing! And at fraction for what you’d pay for a vintage original. Like every Epiphone, the Ltd. Ed. 1970's Inspired Les Paul Custom Blackback PRO comes with Epiphone’s Limited Lifetime warranty backed by world famous 24/7/365 day Gibson Customer Service. Visit your Authorized Epiphone Dealer the classic Les Paul of the future, the Ltd. Ed. 1970's Inspired Les Paul Custom Blackback PRO. Knobs Black with metal insert "witchhats"
The Ltd Ed 1970's Inspired Les Paul Custom Blackback PRO follows classic Les Paul form with a solid, carved Mahogany body. The solid Mahogany neck is hand-fitted and glued-in for optimum neck-to-body contact allowing your LP Custom to resonate as if it’s made from one solid piece of wood. The neck’s comfortable and fast SlimTaper™ profile has a traditional Les Paul style 24.75” scale with a 12” radius, and a 1.68” nut. The LP Custom binding also duplicates vintage models with 7-layer binding on the body’s front and back, 5-layer binding on the headstock, and single layer binding on the fingerboard. The new Ltd Ed 1970's Inspired Les Paul Custom Blackback PRO now features ProBucker™ pickups for that true one-of-a kind Les Paul sound. ProBucker™ pickups feature Alnico II magnets, the same magnets used in sought-after vintage “PAF” humbuckers. Alnico II magnets provide a rich, warm tone with a sparkling high end and a solid low end. The LP Custom PRO features a ProBucker-2™ in the neck position and a ProBucker-3™ in the bridge position. The ProBucker-3™ is slightly overwound to provide balance with the neck pickup and a bit of edge for lead work. ProBuckers™ emulate the sound of original PAF pickups, which were hand-wound. Both the neck and bridge pickups now also feature coil-splitting, controlled by a push/pull volume control, allowing players an infinite variety of pickup tones from single-coil bark to full humbucker bite. When winding humbuckers, Epiphone utilizes a double vacuum waxing process that ensures quiet operation free from microphonic hum. The pickup is first placed in the specialized wax vacuuming system before the cover is placed on the unit to ensure that the wax fully penetrates to the very center of the pickup and solidifies all parts. After the cover is placed on, it is again given a second vacuum wax bath until the unit is completely saturated with wax. Epiphone uses only the highest quality parts for its pickups, such as ABS plastic bobbins, 1010 Cold Rolled Steel pole shoes and pole screws, Alnico magnets and the finest magnet wire available. Part of the allure of the Les Paul Custom is not only its beautiful Antique Ivory finish but also its gold LockTone™ Tune-o-matic bridge and tailpiece, golds screws and trim on the ProBucker™ pickups, a 3-way all metal toggle switch, Epiphone’s exclusive non-rotating heavy duty output jack, and gold Grover™; 16:1 ratio tuners. 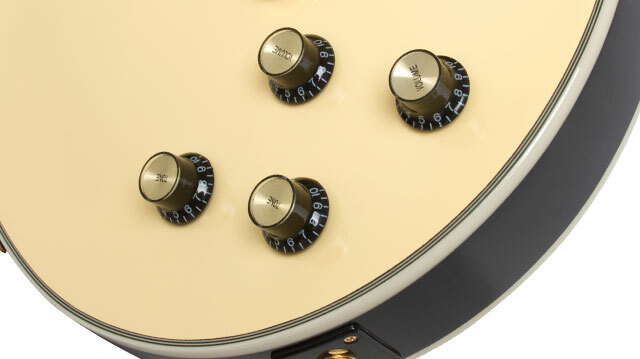 Like the originals, controls knobs are black “witchhats” with metal inserts and each pickup’s volume control has a push/pull switch for coil-splitting.